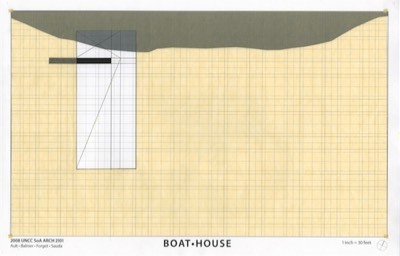 The Boat House project serves as the introductory project for the Second Year Design Studio. The students, coming from a highly regimented and coordinated first year program are introduced to the planning and design of a complex of buildings that will serve as the home for the Charlotte Rowing Club. Through a series of exercise, derivatives of projects that they are familiar from their first year experiences, this project progresses from a gestalt and geometric analysis of a series of shapes overlaid on a tartan grid, through structural articulation and finally building design. This study allows the students freedom to explore the layout of a storage shed, clubhouse, maintenance colonnade and a 56’ turning radius for the rowing shells. This design articulation of the buildings within this complex is explored first through investigations in structural logic and expressive structural characteristics through a series of physical and digital models on the maintenance colonnade. The remaining components of the complex build upon this study and utilize the structural design of the colonnade as a design generator for the structure and aesthetics for the storage shed and clubhouse. In addition to the emphasized aesthetic of the structure the students investigate their designs through a series of experiential animation within the computer. The utilization of the computer in this exercise introduced the students to three-dimensional modeling software but, with the projects kit-of-parts approach, introduced the students to the power of dynamic components in the computer. This approach allows the students to manipulate their designs and clearly understand how the computer can assist them in quickly experimenting with their designs.